This is a question I’m often left pondering. I find myself in a recipe-creating rut, making the same dishes on repeat (you can’t seriously eat spaghetti & meatballs every night, can you . . . or can you?). Variation fuels inspiration—and after this last serving of meatballs—we’ll shift focus to new ingredients, and get the creative juices cooking. Usually my protein of choice is chicken, not because I dislike other meat, but because it’s light & easy to work with. Whether it’s chicken enchiladas, stew, tacos, casserole, salad, soup, strips, pitas, or giant roasted birds, it’s time to expand the repertoire! I still wanted a light protein, but one hearty enough to marinate for max flavor. Seeing that pork tenderloin was on sale (and it’s been ages since I’ve made one), pork made the cut. One of my favorite dishes is Southern-style pork chops—infusing a little sweet with some salty. However, our meat is boneless, so I opted to first marinate in a tangy sauce, pan-sear, and then roast to perfection (well, let’s hope so). Tonight we’re officially having pork loin with a Bourbon & apricot-infused sauce, and that’s not all folks. I make mashed potatoes often, but what else could we have? Keeping with the Southern influence, I decided a coleslaw mix would bring acidity and crunch. Then my eyes caught the batch of biscuits I made a day ago and . . . it’s all coming together! I’ll serve our pork with a creamy slaw ON a toasted biscuit. 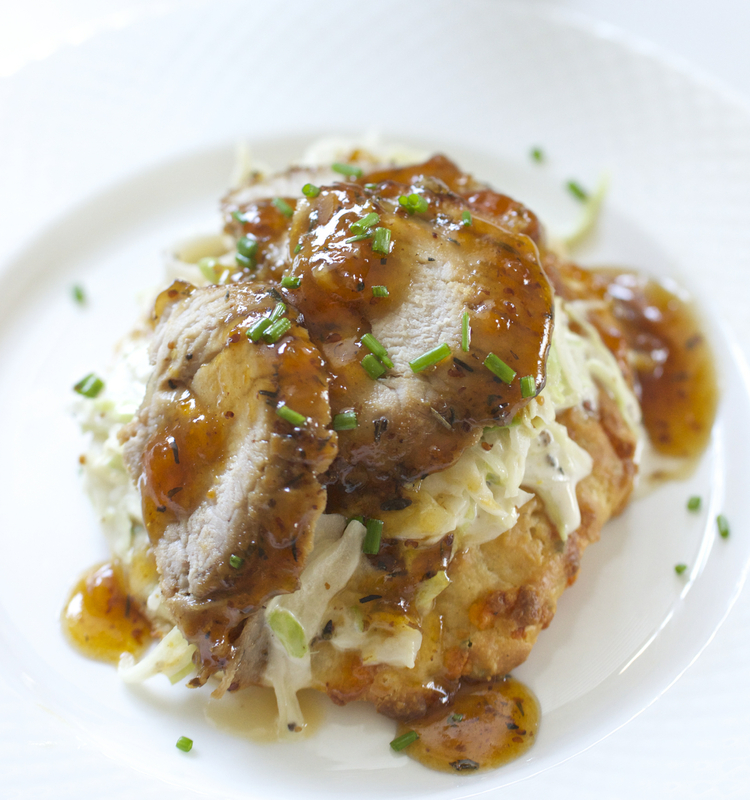 We’re piggy-backing our pork loin, open-faced, sandwich-style! Introducing Bourbon Apricot Pork Loin, Slaw & Cheddar & Chive Buttermilk Biscuit. There’s something about the sweet tang of apricot, with the savory biscuit, and crisp coleslaw—and I’m ready to eat already! Pork loin never had it so good! Sweet & savory sauce pairs perfectly with cool coleslaw & a toasted biscuit. A great alternative to standard pork chops! Recipe: http://www.dinnervine.com/2015/03/cheddar-chive-buttermilk-biscuits/ (can make biscuits while tenderloin marinates to also save time). Rinse & pat dry pork tenderloin & preheat oven to 400 degrees. Whisk together all marinade ingredients in a large bowl, add tenderloin, turning in mix to coat completely. Cover pork loin with plastic wrap & allow to marinate for at least 40 mins (let come to room temp in marinade before cooking on stove). In a bowl whisk together: mustard, mayo, salt, pepper, sugar & apple cider vinegar & transfer to small skillet on stove to warm briefly (low). Place thinly-shredded cabbage into a bowl, drizzle with sauce from pan, tossing to coat well, set aside in refrigerator until plating. Pre-heat large skillet (medium heat) on stove & add ~3T oil, then pan-sear pork (both sides) on medium-high heat (pouring all marinade juices on top) until sides begin to brown. Avoid moving roast until sides are seared & roast pulls away from pan easily (~6 minutes/side). Transfer seared pork onto a rimmed, foil-lined baking sheet & continue to cook pork in oven until meat is no longer pink @ thickest part & meat thermometer reads ~165 degrees (about ~15-25 mins). While roast finishes, make pan sauce on stove by sautéing onion in butter for several mins, add Bourbon, apricot & pinch of sea salt, dash cayenne and stir and simmer on low heat to combine, stir occasionally. When roast is done, drizzle some of the prepared sauce over top to coat/glaze (reserve remaining pan sauce for plating on biscuit), and remove roast from oven. Let glazed roast cool on pan ~15-20 mins to rest, then slice about ~3.4 inch thick. In toaster oven (or conventional) toast pre-baked cheddar biscuits (one/serving) until slightly crispy, remove from oven to cool partially. Plate a toasted biscuit, top with helping of chilled coleslaw, a few pork loin slices & finish by drizzling some remaining pan sauce & chopped chives. The components of this can be made ahead, separately. You can use day-old biscuits since we toast them again in the oven. Also, marinating the pork loin ahead imparts great flavor. If you need to save time & make pork ahead (and have stored in the refrigerator), make sure to let tenderloin come back to room temp before reheating (I recommend heating-up in skillet with a little white wine or broth). The coleslaw can also be made ahead and chilled. By first pan-searing we achieve a flavorful crust, and easily finish in the oven (allowing the meat to remain tender, yet cooked thoroughly). By drizzling the tenderloin with warm pan-sauce, we achieve a nice glaze. Did I mention we get to eat a biscuit for dinner?! This recipe started as an unexpected union, but proved a satisfying solution to the occasional dinner-downer. All of this creativity sure tasted good—hope you’re able to enjoy some too!